Along interior edge of left-hand column on side A, top to bottom: ...]ΘΕΝ[...]ΘΛΟΝ ("from the games at Athens"). The Greater Panathenaia, a state religious festival, honored Athena, the patron goddess of Athens. 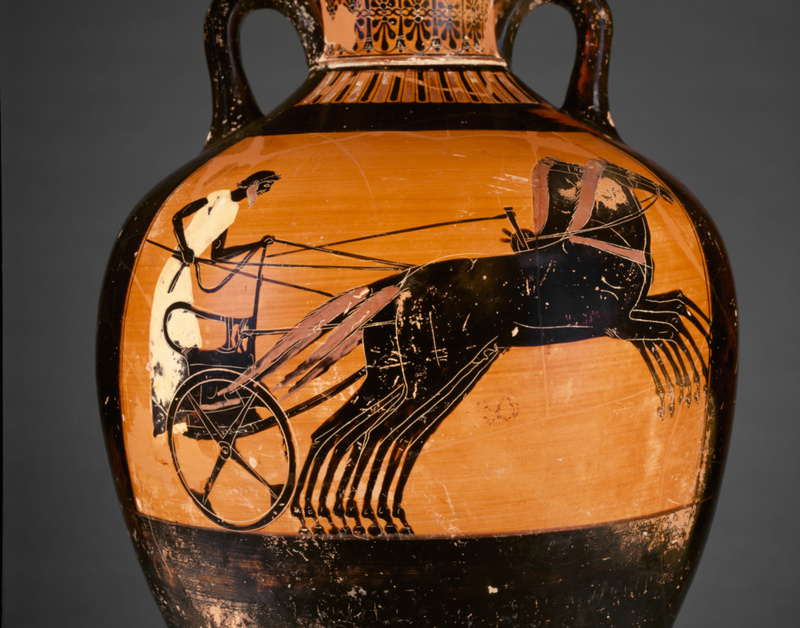 Held every four years, the festival included athletic and musical competitions, and amphorae filled with oil from Athena’s sacred olive trees were given as prizes in the Panathenaic Games. These Panathenaic Amphorae had a distinctive form with narrow necks and feet, and received standard decoration, always in the black-figure technique. 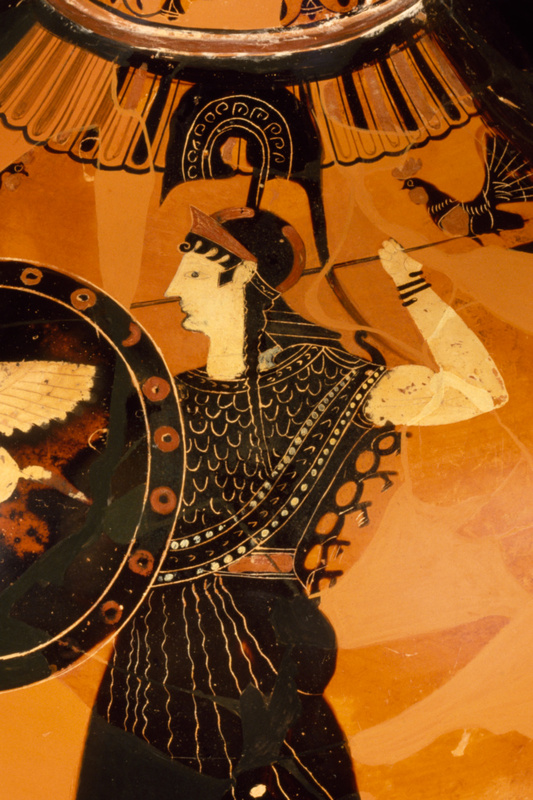 On the front, Athena in her guise as “Promachos” – in the frontline of battle - strides forth between columns. Running along one of the columns is the official inscription, "of the prizes from Athens." 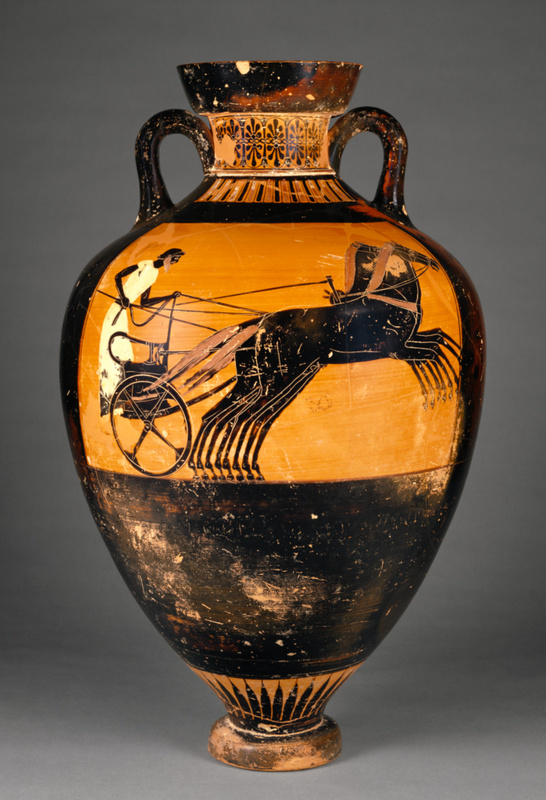 The back depicts the event for which the vase was a prize, in this case the four-horse-chariot race, one of the most prestigious events in the games. 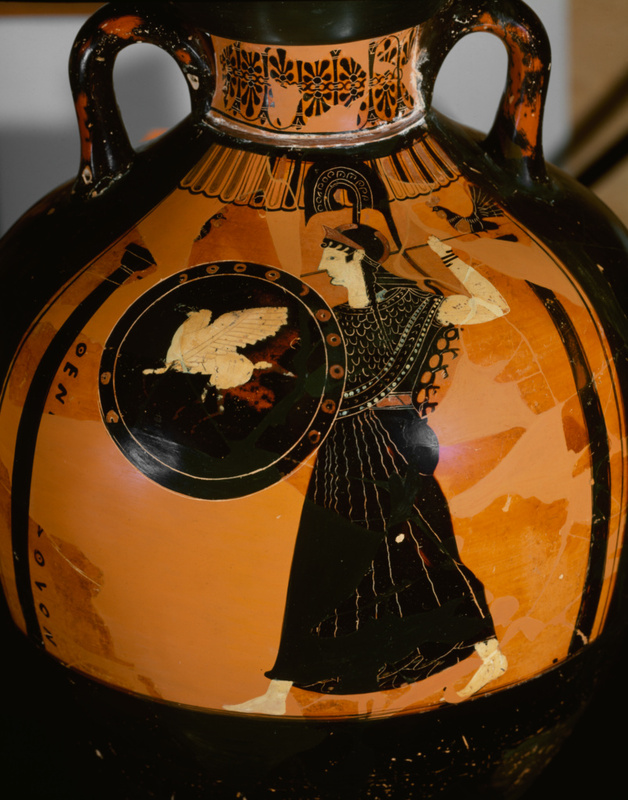 Leading vase-painters decorated these prize amphorae, which were commissioned in large quantities by the state, and their work can often be differentiated by the motif they used to decorate the shield of Athena. 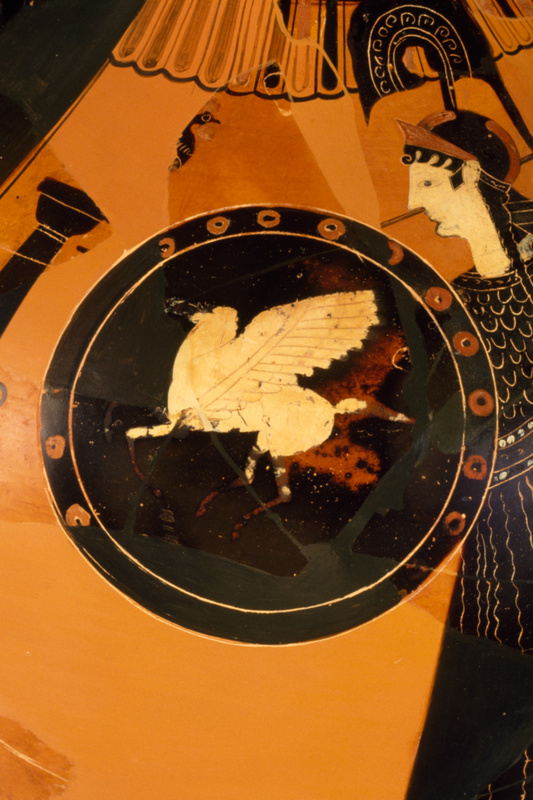 For example, the winged horse Pegasos seen here seems to have been typical for the Kleophrades Painter. Though the oil within was the real prize, the vessels that contained it could be highly valued, as lasting symbols of prowess and excellence. 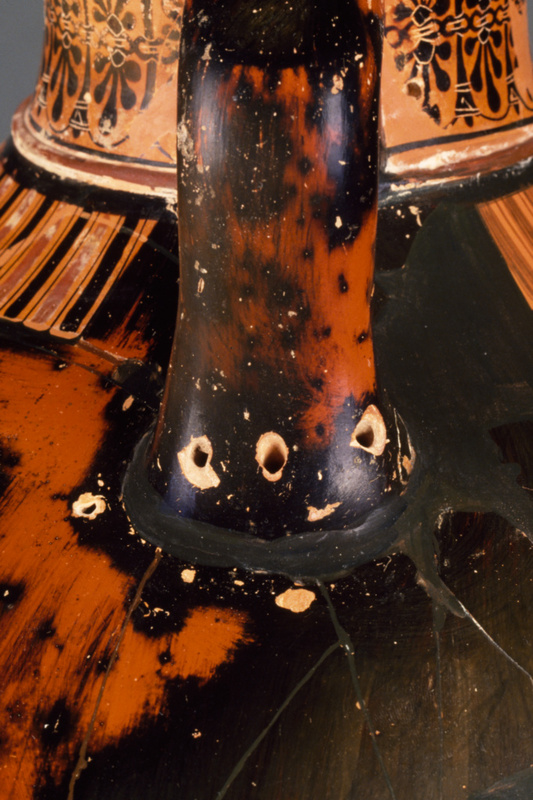 This example preserves ancient repair holes at one of the handles. Nicolas Koutoulakis, 1910 - 1996 (Geneva, Switzerland), donated to the J. Paul Getty Museum, 1977. Frel, Jiří. "The Kleophrades Painter in Malibu." The J. Paul Getty Museum Journal 4 (1977). pp. 63-76, pp. 70-74; figs. 16-19. Frel, Jirí. 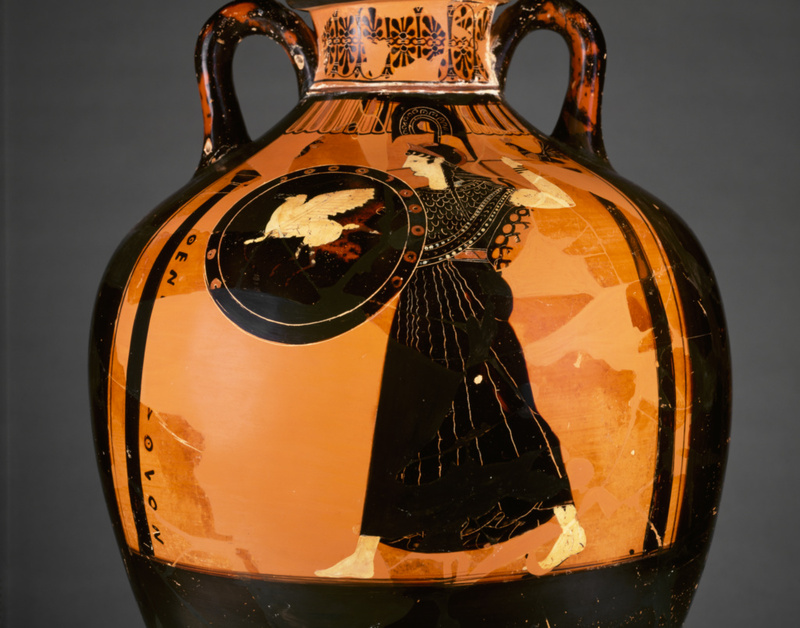 Painting on Vases in Ancient Greece: a Loan Exhibition from The J. Paul Getty Museum. Exh. cat., Art Gallery, Loyola Marymount University, March 20-April 22, 1979, no. 23. The J. Paul Getty Museum Handbook of the Collections. 1st ed. (Malibu: J. Paul Getty Museum, 1986), p. 47. Matheson, Susan. 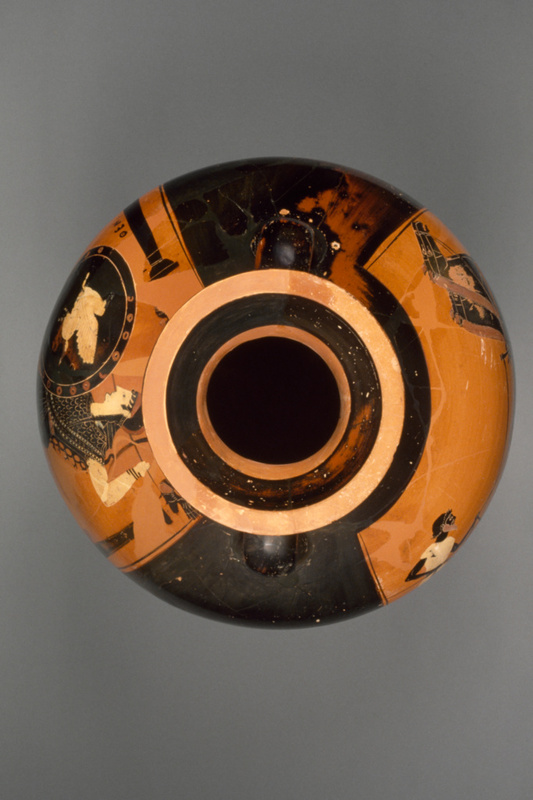 "Panathenaic Amphorae by the Kleophrades Painter," Greek Vases in the J. Paul Getty Museum, 4. Occasional Papers on Antiquities, 5 (1989), pp. 95-112, figs. 1a-c.
Elston, Maya. 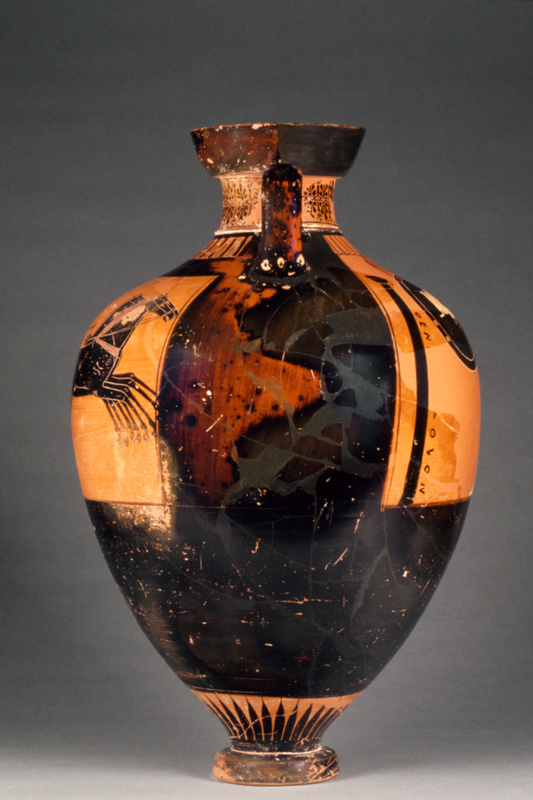 "Ancient Repairs of Greek Vases in the J. Paul Getty Museum." The J. Paul Getty Museum Journal 18 (1990), pp. 53-68, p. 61n20; fig. 20. Hamilton, R. Choes and Anthesteria. Athenian Iconography and Ritual. Ann Arbor: 1992, p. 235, Appendix 7. Kunze-Götte, E. Der Kleophrades-Maler unter Malern schwarzfguriger Amphoren, Eine Werkstattstudie(Philipp von Zabern: Mainz am Rhein, 1992), 19, fn. 43, 20, fn. 47. Manakidou, Elene P. Parastaseis me Armata. Thessaloniki: 1994, p. 293, no. 36 (wrongly cited as 79.AE.9). Bentz, Martin. Panathenaeische Preisamphoren. Eine Athenische Vasengattung und ihre Funktion vom 6.-4.Jahrhundert v. Chr. Antike Kunst Suppl. 18. Basel: 1998, p. 140, no. 5.024; pls. 50-51. Wrongly cited as 79.AE.9. Schreiber, Toby. 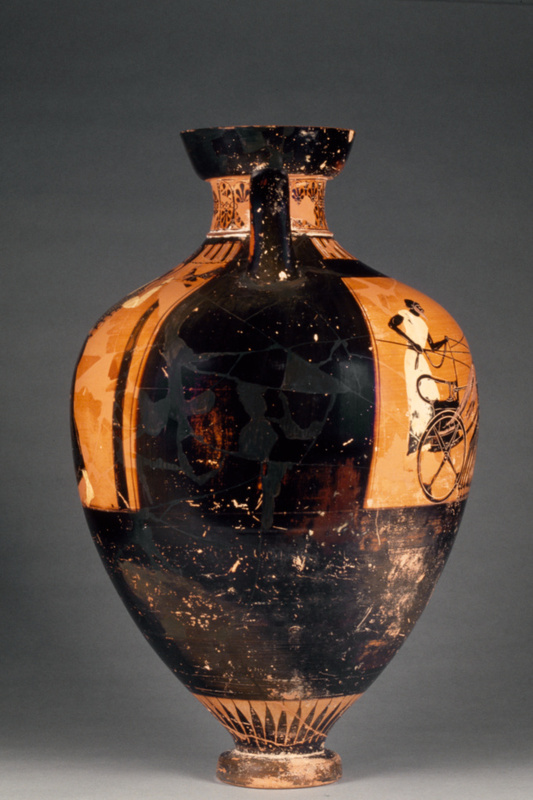 Athenian Vase Construction: A Potter's Analysis (Los Angeles: J. Paul Getty Museum, 1999), pl. II. Zisa, Flavia. "Frammenti di Anfore Panatenaiche Arcaiche al J. Paul Getty Museum," Greek Vases in the J. Paul Getty Museum 6. Occasional Papers on Antiquities 9 (2000), pp. 55-78, pp. 68-69; fig. 13. Boardman, John. 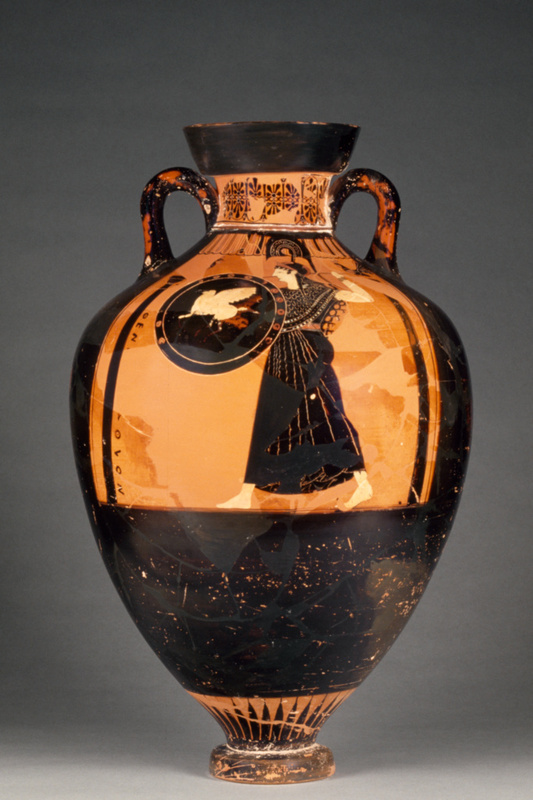 The History of Greek Vases (London: Thames and Hudson, 2001), p. 68; fig. 74. Spivey, Nigel and Squire, Michael. Panorama of the Classical World (Los Angeles: Getty Publications, 2004), pp. 38, 41, figs 48, 57. Miller, Stephen G. Ancient Greek Athletics (New Haven: Yale University Press, 2004), p. 76, fig. 146 (detail).